I'm Not Skinny: 30 days and 5,000 squats. 30 days and 5,000 squats. This showed up on my facebook newsfeed today and I simply can't ignore it. I usually scan right past these, but I love squats and hate pushups so what better way to give myself a challenge! I'm starting today. In fact I've already knocked out the 40 squats now I'm just left to do my pushups. Wow! this is really cool. It's something to strive for and to help someone stay on track. While I can't do push ups, I can try the squats. Thanks for sharing this! 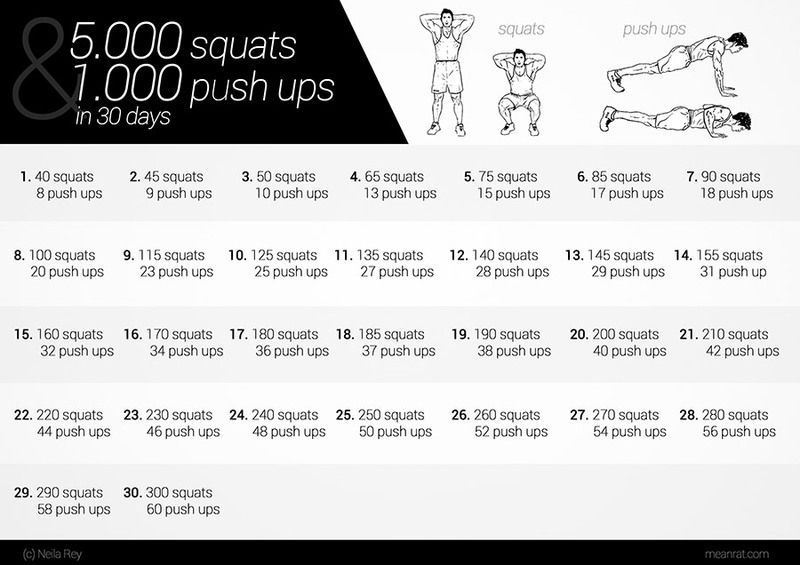 I'm pretty awful at pushups myself, but I'm going to give it a try. Good luck with the squats. Good luck on the challenge! I look forward to hearing about your progress. I wish I could join in on the fun but I am still recovering from a major surgery. It looks like I will have another year to go before I will be up to doing either of these exercises. Well speedy recovery to you. Ohh I hate pushups!!! I would do the squats though! What a crazy challenge! We do 10-10-10 regularly where we do 10 jumping jacks, push ups and situps each morning. But your challenge is even more intense! Really cool! That is one heck of a challenge. Okay are we talking pushups on a counter, girl style or plain hard pushups. I would join but plain hard pushups are not going to happen unless you put nails under me to keep me from collapsing. That is awesome. I wish I could keep up lol. Good luck to you! wow! i am doing this challenge too! Someone I knew was doing the squat challenge and told me that it was really working! I love squats....seriously! LOL this is a good challenge. My goal for 2014 is to transition from girl push ups to regular push ups and go to perfect form. Thanks for sharing.